Kitchen! Kitchen! : grilled baby eggplants.....it makes you say, "oh"...at kitchen! ...kitchen! A fabulous array of exotic dishes and mouth watering baked goods. Easy to follow recipes. grilled baby eggplants.....it makes you say, "oh"...at kitchen! ...kitchen! 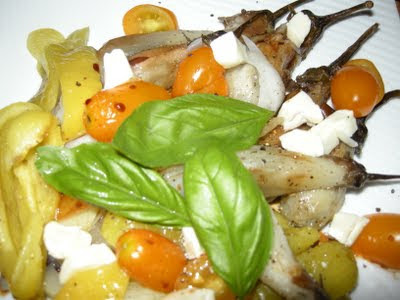 yellow cherry tomatoes, sweet onions and some goat cheese and basil. Drizzled with reduced sweet balsamic vinegar. The farm stand in my area is just overflowing with different varieties of eggplants. But my favorite are the baby eggplants. A lady asked me when I started shoving in those baby eggplants in my grocery carryall with a strange question of, " what do you do with them"? I was caught off guard with her question. What do I do with them??? Does she think I might have plans of doing a "floral" arrangement with these baby eggplants? Well, then again, looking at my carryall loaded with these goodies, I don't blame her if she does think that way. I graciously told her that these are great for grilling or roasting for salads and they cook just as good as the regular ones if not better. Then she gave me an, "oh". Okay.....so I don't know whether her "oh" is said in a positive or negative way. It really doesn't matter to me because my "oh" is like saying OMG these are good!!! In a small pan bring to a boil 3/4 cup balsamic vinegar with some honey and simmer until reduced to almost like a syrup. Taste for seasoning and set a aside. In a large baking sheet lined with foil, sprinkle some olive oil on the foil and spread all the vegetables and gently coat them with olive oil. Sprinkle some salt and pepper and roast in a 350F preheated oven for 20-30 minutes until the eggplants are soft and offer no resistance when you poke them with a fork. Let cool and peel off the skin on the peppers and egg plants leaving them whole. Cut the pepper lenghtwise and sliced the onions. Gently combine the roasted vegetables in a bowl. Transfer to a serving platter, add some yellow cherry tomatoes cut in half and drizzle the reduced balsamic vinegar and add your favorite goat cheese. Garnish with basil or your favorite herb.